Content management systems have been around for some time now and I believe most are overly complex with so many bells and whistles it seems they forgot why they got into this business. Content Management Systems are meant to do just that store content for your website in an efficient manner so you can go about your business. Most CMSs don't allow you to have complete design freedom and those that do force you to learn their own language or design template. I've even seen some that keep some of their template code under lock and key. But not till recently, for myself I have discovered PageLime which is a great CMS that is simple clean and allows for full creative design and is really easy to integrate into an already built site. 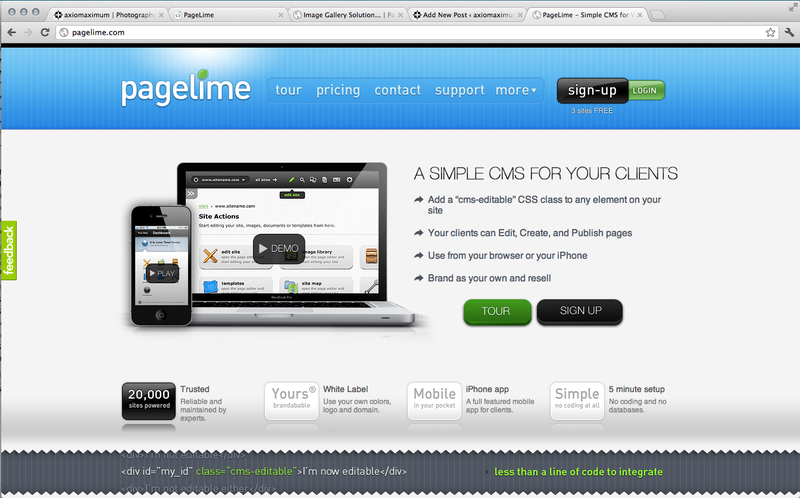 PageLime is simple to learn and intuitive at first glance for your clients. The interface has an apple like design. Just check out their website PageLime and see for yourself. They have a great video on how to get started and best of all, it's free! Oh and they have an iPhone app. LimePage seems to be a new company that is growing in a positive direction. Do you have a really simple CMS that you would like to share? Leave a comment below.